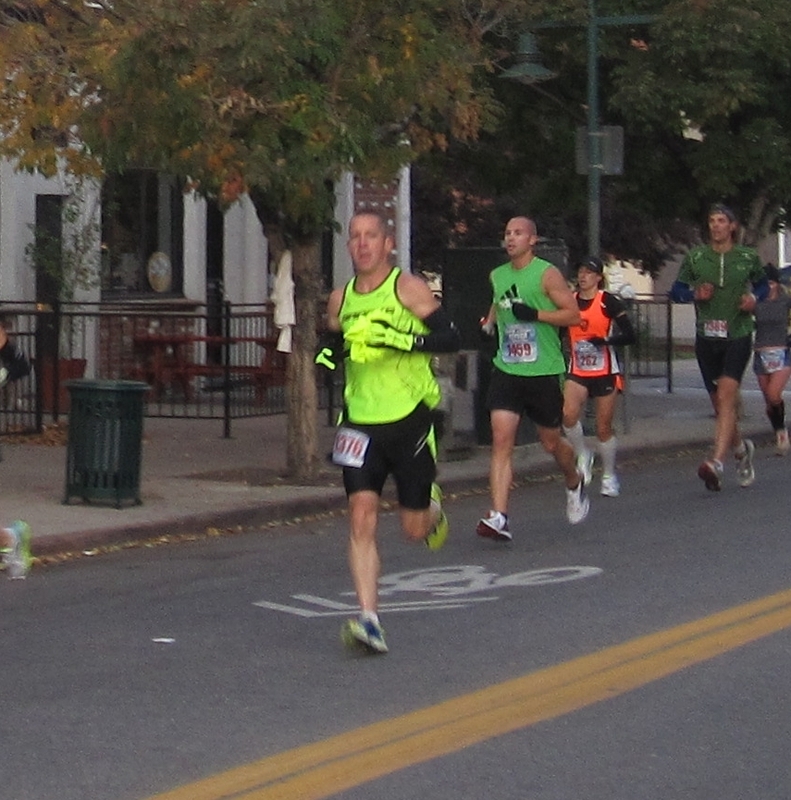 Sunday’s Denver Half-Marathon marked a significant point in our preparations for New York in 4 weeks. It was the third consecutive weekend of racing, while continuing to pile up the training miles at the same time. Each race served more as a “tough workout” on the way to the starting line in NYC, but I did try to stay focused on each of the events and race them true and honest. Not only was it important to push it out there and try to lock in at 10K pace and half-marathon pace – but it would also allow me to take a look back on my performance in the events and determine what I might need to tweak just a bit over the next two weeks of training, before my taper. Traditionally I have used a three-week taper leading up to a marathon. Last year in Austin I felt like I was a little “stale” on race weekend and would have preferred to run the race a week earlier. I came to the conclusion that a two-week taper period is what I would incorporate into my preparation for New York – but there was a part of me who wanted to see how well my legs rebounded in Denver for another high-intensity race – this one at altitude – so close to last weekend’s IBM uptown Classic. Which brings us to the other variable at Denver – racing at 5,200 feet above sea level – something I had never done before. There have been a lot of studies conducted trying to measure the effect that the altitude has on race performance. I purposely held off on researching the topic before the race on Sunday as I didn’t want it to get into my head. Nothing worse than negative thoughts on race day. If I was in fact slower in Denver, I wanted it to be because of a physical reason, not a psychosomatic response to negative thoughts and energy. 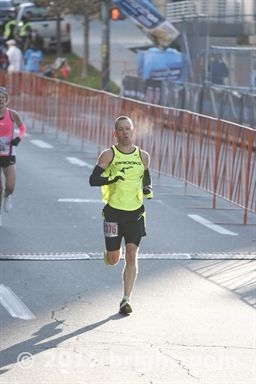 I decided that I would run this race essentially as a “no-look” half-marathon, where I locked in at my race pace and kept the needle steady over the hilly half-marathon course. I would only glance at my splits when I heard the beep at the end of each half-mile to gauge how I was holding up, but I did not try to hold a particular pace half-mile after half-mile. This was a bit of a departure from my previous half-marathons and marathons, but a strategy I felt was wise given that Denver was not an “A” race – it was just another stop on the train to NYC. A test really. One that hopefully would point towards a positive jumping off point entering our final phase of training. Saturday: The weather turned truly nasty on Saturday as the race approached. Rain and winds came into the Denver area with temperatures dropping into the mid 30’s. Some areas just outside of downtown Denver, and of course the surrounding mountains received their first snow fall of the year. In the city it was cold, raw and wet. Saturday morning at 6:55 a.m. (race time on Sunday) – My sister-in-law Kim and I drove up to Cheesman Park to run what would turn out to be mile 11-12 of the half-marathon course the following day. This part of the course featured the longest climb and the highest elevation on the course. It would literally be “all down hill” from this point and I wanted to be able to run that part of the course and have it filed away in my memory bank for race day. The 2-mile shakeout only lasted 13:43 – but it was enough to be out there in the rain and wind. It had been a long time since I had run in those conditions and I definitely haven’t been missing anything. If the rain and wind moved out like the meteorologists were predicting however, it might just be a pretty close to perfect race day on Sunday. Pre-Race: On Sunday morning I woke up a little over two hours prior to the starting gun. Same routine as always, brush the teeth, get geared up and I had my breakfast of an Einstein’s Pretzel Bagel and a banana. Washed it down with an Orange Gatorade and had a few sips of Diet Dr. Pepper to get some caffeine into the system. I threw on my throw away sweats that I purchased to leave at the starting area just before the gun, which would be collected and given to the local homeless shelter. The weather turned out to be just about perfect. Maybe two or three degrees cooler than I would have liked, but there was no rain, calm winds (6 mph~) and temperatures hovering right around 39 degrees. I decided to dress in shorts, my brooks singlet, Moeben arm sleeves, light gloves and a long-sleeve technical shirt over top. I pinned my bib to my shorts so I could toss my long sleeve shirt to Dawn, Landry and the rest of my family when I passed them at the mile 2.5 mark. If for some reason I didn’t see them on the course, I would just drop my shirt and move on without it. Warm-Up: After dropping off my bag at gear check and getting Kim settled for her first half-marathon, I made my way over to the starting corral. They started to rope off the corrals, so I ducked out and ran a quick ½ mile warm-up at a slow pace, just to get the blood flowing in my legs. My legs felt a little more fatigued than they had the week before running my warm-up at the IBM Uptown Classic, which was understandable. But all things considered, I felt pretty “runnerish”. I ducked back into Corral 1 – just behind the elite runners and found a spot in the middle of the area, perhaps 100 runners or so in front of me. It was a wave start, so we would be going off at the gun right after the wheel chair athletes. I ditched my sweats, took a final sip of Gatorade as I heard hydration and electrolyte replacement was even more important at altitude and ditched my knit cap at the end of the Star Spangled Banner. Nod to the sky for Dom – Check. The Start: At the sound of the gun we were off and I tucked in behind a group of runners so I would not be tempted to go out too fast over the first downhill mile. The course would gradually descend for the first full mile, roll flat over mile two and then start a three-mile long climb from the end of mile 2 up to mile 5. I wanted to run something in the 6:20 range to open things up, then settle in and let the topography of the course determine my middle splits. The pace seemed to be coming to me nice and easy and as the sun started to peak over the buildings in Downtown Denver – we were 1 mile in to our final race before New York City. As we hit the flat section over mile two my pace was rock solid even with identical ½ mile splits. We made a few turns around the Pepsi Center Area – really my only complaint about the course was the number of turns and tight turns, there were even three cone 180 turns along the way – pretty unheard of these days for an urban half-marathon. As we hit the first climb of the course at mile two we started making our way towards the Rockies stadium. 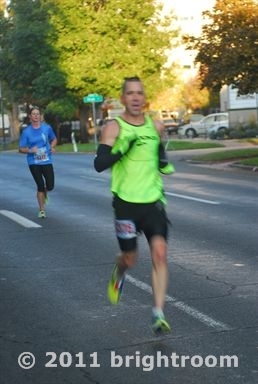 At the 2.5 mile mark I pulled off my top layer and balled it up into my right hand. We passed by the second Band playing and I knew I would either see Dawn and the gang in the next 3/10 of a mile or not at all. After a few hundred meters I saw the front wheel of Landry’s stroller sticking out from a small crowd huddled together and got ready for the greet and flip. I tossed my shirt, gave a quick wink of the eye to everyone and made a right turn back uphill towards mile 3. The opening section of the race had gone according to plan, I was settling in nicely, but had another couple of miles to go before we would catch a break with the topography. Three down, 10.1 to go. The Second Quarter: We started to pick up some crowd support at this point of the course and when we clicked over the fourth mile I could feel the hills and the altitude start to take their first bites out of me. It appeared to me that the altitude was not necessarily making me feel like I was “working harder”, I felt like I normally would at half-marathon pace, but my time seemed to be about :10 per mile slower than my effort. The other factor I was noticing was that after cresting a hill it was taking me longer to fully “recover” and regain my breathing rhythm and cadence. It would come back to me, but not within 300-400 meters as usual. It seemed to be taking 600-800 meters until I was able to settle back in. All great training I thought as I approached the climb up 17th street, for the first time I started to think about the Queensboro Bridge in New York City, and not the street rising up in front of me in Denver. We made it to the top of the hill at mile 5 and I grabbed a splash of water at the water stop. My plan was to hydrate at every stop along the way until we reached mile 10, then I would decide if I needed to continue on with that strategy. I was hoping that by mile 10 I would be feeling fine and could run with my breathing uninterrupted over the final 5 Kilometers. Hydrate early and fully, race hard to the end. At the top of mile 5 we finally got to enjoy a little bit of a downhill stretch. Instead of pushing the pace, I decided to regain control of the race, lock in and stay smooth. Not quite to the half-way point, it was too early to really push the envelope. Needed higher speed film to catch me! So far the voice had been quiet, but as we started to climb again up to mile 7 as we entered the Zoo and Park area, I knew it wouldn’t be long. The course was going to be a little difficult in this section, then again from miles 9-11 before things started to tilt back into the favor of the runners heading to the finish. I started to think about the middle miles in New York, how I just need to disassociate and not read too much into the accumulating soreness or tightening of my muscles. Just tick ‘em off I kept telling myself, and I decided to focus on the runners around me, who was looking strong, who was running smooth and even. I picked out a tall runner in a red singlet and black calf sleeves who had been running about :05 ahead of me and locked in. I would keep him right there until we reached the park. On that final uphill climb, I would take him. The Fourth Quarter: At the start of mile 10 we reached a part of the course that I had not seen before. It was an area of one way streets that during my recon drive of the course earlier in the week we had not been able to get a feel for. The climb up mile 10 was a little bit surprising in how long it was. It was a gradual climb from 5,250 feet up to 5,350 over a full mile, but it was the first time of the race where I felt like I was slowing. I just needed to hang tough I thought as I hit the aid station. Another mile or so and I would be at the top of the race course. Slowly I was gaining on the tall runner up ahead. It seemed that for every 10 strides I was picking up 5 feet or so on him. We turned left into the park and I nudged closer to him, as the road wound its way to the right and the climb got steeper I was on his left shoulder, ten more strides and I pulled in front of him. Keep pushing it I thought – almost to the top. Time to go: We made the final turn out of the park and I pulled alongside a young runner who was a member of the US Air Force. We ran stride for stride for a half-mile and went through the final aid station together. I decided on just a splash of water as my lips were dry, but not enough to disrupt my breathing. I fell back into a cadence that matched my opening mile and decided I would lock in there until we made the final left turn to the finish line. With .25 of a mile to go I would kick. The mile felt great to be hammering away to the finish. I held back just a touch on the gas as I wanted to finish the race at a full sprint as this would be the last mile I would run at race effort before we would toe the line in NYC. The crowd along the course was starting to fill up and there was a lot of encouragement being thrown our way as we pushed to the finish. I clocked my final full mile in 6:20. My second fastest mile of the race only falling short of the opening downhill mile of the race by :03 seconds. I pressed the accelerator one more time over the final tenth of a mile covering it in under :44 seconds. 5:18 pace. I hit the mat and glanced over at the Race Clock. 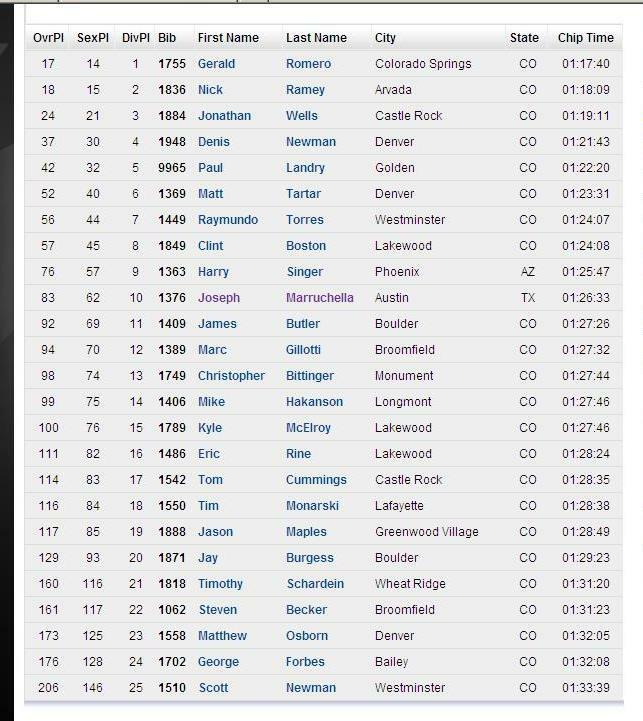 My time would be the 83rd fastest among the 8,909 runners in the half marathon, good for 10thplace in the Male 40-44 Age Group – and one of only two runners in the top 20 who was not from Denver, Boulder or another part of Colorado. Post Race: One of the rare times when Dawn and Landry would not be at the finishing area to greet me post-race. I got my medal, grabbed a water and a heat sheet and made my way over to the gear-check area to get my bag, put on some warm clothes and retrieve my phone. This was one of the more complicated races logistically, where the mission now as to reunite with family and then try to get back over to the finish area to see Kim wrap up her half-marathon. Once we had everyone situated in the family reunion area, a few of us headed over to the finishing chute. I thought that Kim would run somewhere around a 2:20 in her first half and depending on how long it took the race officials to release each of the starting waves, Kim should be coming through the chute around 9:30 a.m.
Sure enough, right as rain, Kim finished her first half-marathon ahead of pace at 2:18:46. An absolutely tremendous effort as she ran her race the whole way and finished with a big smile on her face. The only goal anyone should have in their first long-distance race, whether it is the half-marathon or full marathon is exactly that, to finish happy and healthy. What does it all mean: I traveled out to Denver in search of some answers as to our capabilities in New York City and came away feeling as confident as ever. I ran my second fastest half-marathon, besting my time at last year’s Decker Half-Marathon in Austin. That time was good enough for fourth place in my Age Group, missing out on a third place age group award by a single second. Anytime I can finish in/around the age group awards in Austin in a major race, I know that I turned in a quality effort. My Denver time was :12 faster, only my PR of 1:23:55 at the 3M Half-Marathon reigns supreme. When I visited the Run Works website – which takes into account the altitude where a race has been run and then projects that finish time at various elevations from sea level to 10,000 feet – had I raced at 1,000 feet on Sunday (Austin is 684 feet) as opposed to in excess of 5,200 feet, my race time equivalent would have been 1:23:33 or a :22 second PR. Jack Daniels (the runner and coach, not the alcohol) is certainly an expert, and who am I to argue with his study – but let’s just say that the altitude slowed me by just two minutes on Sunday, not the 3 minutes he projects – that revised time of 1:24:33 would still put me well in line for a 3 hour marathon in New York if the weather cooperates and I run the race of my life. Over the past two weekends I have posted two performances – in the middle of training – with no taper – that are strong indicators that good things are ahead in New York. Will I make it? Nobody really knows, if they did, the New York Road Runners Organization could just mail me my finisher’s medal and post a time for me of 2:59:59 – it just is not that simple when it comes to the marathon. It is an incredibly difficult race to predict the outcome in. When I started this training cycle and I went for my very first run of 6.2 miles back on June 21st – the only thing I wanted heading into race day was a clear indicator as to whether I was going to be able to go for it or not that morning in November, standing on the Verrazzano Narrows Bridge. I wanted to know one way or the other if I was ready to make a run at a sub 3:00 hour marathon or if I was not quite there. Not quite good enough. The worst thing that could happen would be if I remained on the fence. Unsure of myself and my goals for the day. Well, even me who has every reason to be the biggest skeptic out there is having a hard time finding a reason “Not” to go for it in New York. So, here we are – if the weather cooperates – it’s on. 26.2 Miles at 6:52 pace. As I tore into my race confirmation from the Boston Athletic Association yesterday and saw my acceptance into this Spring’s Boston Marathon it really hit home. You’re not some back of the packer anymore. You’ve done the work, put in your miles and worked at this sport as hard as anyone. November 6th is going to be my day. It has to be. Time to go get ours. That is moving Joe. Excellent race. I loved what you said and have been thinking about the exact same thing for my marathon. “How much pain am I willing to accept?” It is one thing to know what you can do but are you willing to deal with the pain and deliver. Well done. I can’t wait for New York for you my friend. Nice report and another solid race Joe, so hard to read into a race at altitude and with elevation changes, but it does seem indicative of a strong shot at 3:00 at NYC. Just start your visualizing now, and think about relaxing and staying on pace, not ahead, and using short surges where needed to get back to pace. You may find you don’t even need the “how much pain” thought. Greg – congrats again on a TREMENDOUS race this weekend. 2:56 – are you kidding me? Great, great stuff – so happy for you and congrats on the 1st place overall – just amazing. Thank you for all the kind words, thoughts and advice as I look to dial it in for New York City. (I hope you are right about that pain management) – I’m hoping that 6:50 feels nice and easy that morning – we’re going to give it our best shot for sure. It’s on, Joe. All yours, my man!! Thanks Bulldog! You’re advice and counsel is greatly appreciated – congrats again on your victory at the 50-miler this past weekend. Just tremendous! Love the race report, but love the confidence even more. Go get your sub-3, Joe. It’s there for you. Thanks Sean! 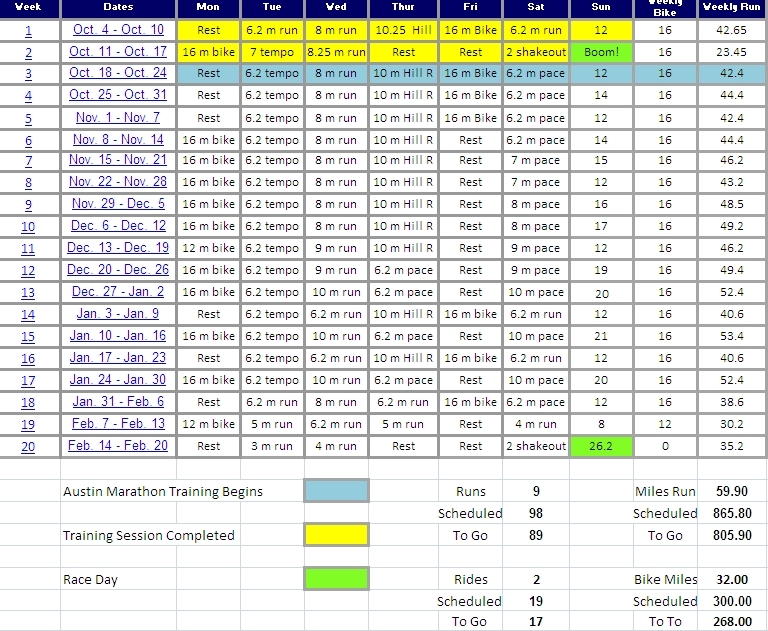 It’s been 8 months of rehashing the Austin Marathon and trying to give ourselves a real chance at this thing. Time to get on with it. Strong work Joe! Great report too! Great race – you’re setting yourself up for an awesome experience in November. David – thanks so much for the visit and the kind words! It is going to be a wild ride in New York that’s for sure!